A symbiotic relationship exists between thinking, learning and assessment. Criteria, void of thinking, result in little more than ‘quantity’ statements or statements of subjective ‘quality’ language. Neither stretches the learner in their performance, and the latter results in confusion and often a need for moderation. When a learner is provided with criteria, but is not given the opportunity to develop knowledge and understanding of their elements, its use is compromised and the end result disappointing. This book is about the thinking and learning process. It’s about the relationship between assessment, thinking and learning. 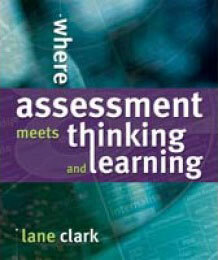 It’s where assessment meets thinking and learning! This book includes a CD that contains more than one hundred examples of content, process and skills criteria, representing many different curriculum areas, at a diversity of developmental levels. Associated information organisers and planners are also included. Lane has provided you with so much – changing your assessment and evaluation practice will be easier than you think!